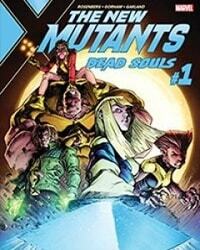 New Mutants: Dead Souls Average 4.57/5 - out of 78 total votes. THEY AREN’T JUST THE X-MEN IN TRAINING ANYMORE! The New Mutants are launching themselves headfirst into some of the creepiest corners of the Marvel Universe, going on the missions no one else will. But does the team know what they are really hunting for? And what are they willing to do to get it? The enigmatic MAGIK will lead her team of WOLFSBANE, RICTOR, BOOM-BOOM and STRONG GUY and bring them face-to-face with paranormal threats that they may not be prepared for, and that might just tear them apart! Rising-star writer Matthew Rosenberg (PHOENIX RESURRECTION) teams up with future superstars Adam Gorham and Michael Garland (ROCKET) to bring you the next chapter in the lives of Marvel’s underdog team. Welcome to the new class of New Mutants — hope you make it out alive.